It may have taken Anna Sugden a while to reach her dream of being a romance writer but I'm so glad she never gave up. After careers in global marketing and teaching, Anna - a Brit - finally turned her total focus to writing when her husband's job took them to New Jersey in 2002. 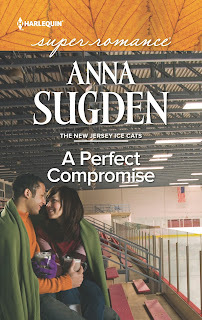 They returned to England in 2008 but Anna kept writing and in 2012 she sold her first book and the New Jersey Ice Cats were born. Anna's love of sports - especially hockey - shines through in her books. She also loves classic films, cross-stitch, good food, wine, penguins and, especially, great shoes! Welcome back, Anna! It’s always a treat when you bring us a new Ice Cats love story. Please tell our readers what they should expect from A Perfect Compromise. readers at the Romance Dish. This is the fourth book in the series and it moves away slightly from the Badolettis and the Jelineks -- although not too much since JB is like an adopted son/brother -- to feature reader favourite Jean Baptiste Larocque. This is a story about coping with the curveballs that life throws at you (I know, wrong sport ). For both JB and Issy, they have their sights set on certain goals and what should be a fun vacation fling really ends up causing major problems for them both! It’s also about the idea that love takes work and compromise. J.B. has a lot of growing up to do in this book before he can move from Mr. Right Now to Mr. Right. What was the most difficult part of writing this character? What do you want readers to understand about him? Getting the balance right. JB is a player, both on and off the ice. He doesn’t like responsibility or commitment and he’s happy with a free and easy life. But, at the same time, he’s not a bad or mean or selfish person. He’s charming, fun, loyal and well-intentioned. A genuine guy, an honest guy, whose heart is in the right place. Unfortunately, as we’ve seen in the other books, he gets caught up in bad situations. So, with all of that, it was important to ensure readers could see both the good and bad of JB. J.B. and Issy are in two very different places in their lives when they first meet and must overcome some significant obstacles before they have a chance to make a relationship work. What is it about these two that convinced you they were meant to be together? You know how sometimes you just know when two people will be perfect for each other? That’s what happened when Issy appeared in my head. She kept telling me how much JB couldn’t work for her and yet … J. I think it’s because they’re such different people with such different needs that they work. They bring out the best in each other. JB loosens up Issy and Issy shows JB that ties and commitment don’t have to be a noose around his neck. solely a product of your imagination? The character was originally inspired by a combination of former Devil, Johnny Oduya, and former Yankee, Derek Jeter. But the actual physical inspiration was Shemar Moore. Whenever I see him on Criminal Minds, I say - ‘There’s JB!’ . After losing the Stanley Cup at the beginning of the book, J.B. and his teammate, Mad Dog take off for a getaway in Antigua. What location would be your favorite getaway? Anywhere warm and sunny, with a beach or lake! I was lucky enough to be whisked away to Antigua for my 50th birthday and it was the perfect spot to spend two weeks chilling out with my lovely hubby. If we can’t make it to the Caribbean, we love Italy and have a soft spot for Charleston, SC. Both places have everything we love -- good food, nice people, great weather, a laid-back atmosphere and the occasional fab shoe shop! In the book, Issy fantasizes about chocolate brownies topped with hummus. What’s the weirdest food combination that makes your taste buds sparkle? At least Issy can blame her craving on her pregnancy! LOL I don’t think my tastes are that weird. I love peanut butter and cream cheese omelettes. I also love peanut butter and banana. Marmalade and sharp cheddar is another fave. My lovely hubby makes an awesome lime curd which is also yummy with sharp cheddar. In a large bowl (clear is better so you can show off the layers), layer the ingredients in the same order as above, starting with the chili. Serve with tortilla chips or strips. At Issy’s first hockey game, J.B. scores the winning goal and gives her the game-winning puck. What’s your most prized sports memorabilia item? Oh it’s so hard to choose. You should see my office walls - covered in all kinds of hockey memorabilia. Signed pictures, game-used sticks, pucks and jerseys. All, naturally, from my beloved Devils. J. If I had to pick one, I think it would be Brian Gionta’s game-worn jersey from the night they retired Scott Stevens’ number. It’s signed by both Brian - who scored in the game - and Scotty. Will there be more Ice Cats books? Definitely! I’m currently working on book 5, which is tentatively entitled A Perfect Plan. It features recently retired Ice Cats’ captain, Scott ‘Scotty’ Matthews, and Issy’s best friend from A Perfect Compromise, Sapphire Houlihan. All the latest news is on my website www.annasugden.com. That is where I post my free short stories, as well, so it’s worth checking out! I’m planning to write more holiday-themed short stories featuring some of the secondary characters from the team. I hope to offer A Perfect Bouquet, a Valentine-themed story on my website in February. And, in response to readers’ requests, I’m hoping to release A Perfect Selection - an anthology of the short stories - for sale in March. Thanks, Anna! Would you like to ask our readers a question? For those of you who’ve had children, did you get pregnancy cravings and if so, what were they? For the rest of you, what is your weirdest food combination favourite? 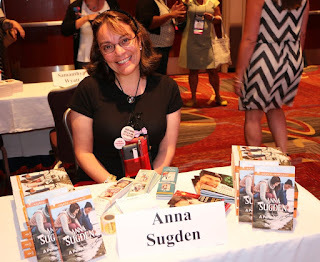 Anna has generously offered several giveaways so start posting those comments! I did have a few cravings when I was pregnant, but it was so long ago I don't remember. I wanted peanut butter on toast, but it would upset my stomach. I really don't remember having any weird cravings. Hi librarypat! Thanks for stopping by today. That's what a lot of people told me - food they normally liked would turn their stomach! Hey Anna! I'm totally jelly of your collection, if only mine was half as cool as yours but then mine would be Jets related of course. :D No kids here but my weird food combo would be putting ketchup on my rice, it's a strange but I think it's a pretty fantastic combination! Hey Ada! Thanks for joining in the fun today! I'm jealous of your job - being able to watch your Jets from such a great seat! I know a lot of kids who put ketchup on their rice - you're obviously young at heart! "This is a story about coping with the curveballs that life throws at you (I know, wrong sport )"
I think you must have been seduced by those hunky American sports heroes! I would love to read a sporting romance centred on test match cricket or premier league football .... and the English ladies are doing pretty well in both sports right now. That would be Baked Alaska with lashings of je ne sais quoi created from the chef's imagination. Sorry replace life throws with life bowls !!! Hey Quantum! Great to see you! Between you and me, I'm not a big cricket fan ('ex' issues!) - shh I know it's sacrilege. But I am a huge footie fan (Man Utd season ticket holder). I'd love to write some Premier League stories some day. I hoped there might be interest after the Rugby series, but no joy. Yes! The English ladies are rocking! Ever since I was pregnant with my first child, over 30 years ago, I almost always have ice cream for breakfast. I put chocolate chips in my coffee. Hi Laurie! Thanks for stopping by! Ice Cream for breakfast works for me - wonder if I can get away with it even though I've never had a baby. Oh yum on the chocolate chips in your coffee. Hi, I love sports related stories. Would love to win the short stories if possible as I think I have the others on my oh so long tbr. But would be happy to take any and pass them along if I won. No cravings or crazy combos. Boring me. Hi ladbookfan! Thanks for joining in the fun. You're not boring at all! I hope you get a chance to delve into your TBR mountain (I have one of those!) and catch up with the Ice Cats! I never had cravings when I was pregnant. I avoid strange combo's. Your sports books are captivating. No cravings with my first pregnancy, but I had cravings for corn on the cob and peanut butter with my second pregnancy. Hi Diane. Thanks for joining in the fun today. I love it - corn on the cob with peanut butter! Yes, fried egg sandwich with bacon, cheese, pickle and ketchup - especially ketchup lol. I worked near a McDonalds with my first pregnancy and ordered one M through F. With the second I had to make them myself lol. Hey Catslady! Great to see you here today! That is one heck of a craving - sounded yummy until you added the pickle (and I love pickles normally!) LOL. A Perfect Compromise downloaded to my Kindle earlier this week. I am eager to read it. No pregnancies for me, but I can remember some strange combinations as a teen including balogna and banana with mayo on white bread. Frankly, my stomach rolls just typing the combo now, but one of my BFFs and I loved them when we were 15. Hey Janga! Lovely to see you! And thank you for letting me know that you ordered A Perfect Compromise - you've made my day! You know, having grown up in the US, I had several friends who made weird combo sandwiches with bologna! I enjoy sports-themed romances. No pregnancy cravings, but as someone said above, in school, I did have ice cream for breakfast a few times. Hi Kim! Thanks for stopping by today. 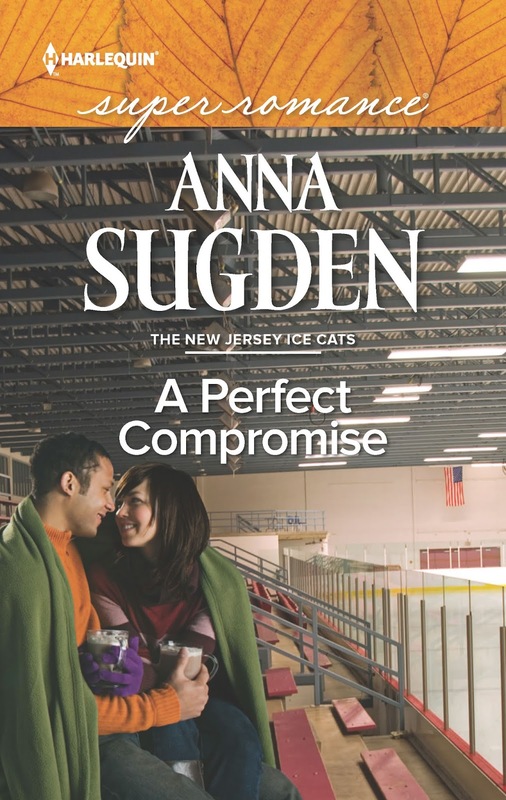 I'm so glad you're a sports romance fan - I hope you enjoy the Ice Cats. Hi Cheryl! Thanks for joining in the fun! LOL oh bless your hubby for doing the pizza run for you. At least it was just ordinary pizza. I had a friend who wanted pickles on her pizza and her hubby had to go and get the pickles separately and put them on the pizza before bringing it home! Sports novels are a delight. When I was younger I had a unique combo tuna with mustard, on toast. Otherwise no cravings nor weird combinations. Hey Petite! Great to see you here! So glad you're another sports romance fan! Welcome, Anna! It's great to have you back! One of my weird taste combos dates back to my teens and my first job, as a carhop at a drive-in restaurant. This was an "after closing" treat my favorite cook would make for us while we cleaned up. It's a hamburger patty with cream cheese and sliced green olives on grilled white bread. I still love it today! Hey PJ! It's always such fun to hang out with you Dishy Dames! How funny, because I remember someone I grew up with loving exactly the same combination! Except she worked at a diner. Congrats on the new release, Anna! Can't think of anything I like that is a weird food combo, but my cousin once ordered a ham sandwich in a deli and by mistake the roll was smeared with butter instead of the usual musard/mayo, but he said it was so delicious and he now sometimes orders a ham sandwich with butter. No need to enter me in the giveaway. No kiddos.... but when I was young, I liked sandwiches of grape jelly [for whatever reason, the only choice in our house except when leg of lamb was served with mint jelly] and American cheese.... not gourmet to say the least!!! Hi Girlygirl! Thanks for stopping by! Ooh leg of lamb with mint jelly - yum. Grape jelly and American cheese sounds good. It's that mix of sweet and sharp that works, I think. Hi Anna, Being a big Chicago Blackhawks fan, I get to claim Oduya also. He helped us win a couple of Stanley Cups. I also agree on Shemar Moore. Weirdest combination was ketchup and relish on bread. My husband looked at me like I was crazy. I have never eaten that since. Looking forward to reading your books. I love football and hockey. I've never tried them in a sandwich but I do love the cream cheese and maraschino cherry combo. I skewer them on toothpicks with a chuck of pineapple for appetizers. Good stuff. Hi Di! Thanks for joining in the fun! Interesting combination. We have a cheese over here which is Wensleydale cheddar and cranberries - one of my faves - I imagine that's much the same thing. Baby Ruth candy bars . In fact that was all I could eat and keep down I lost 45 pounds while pregnant with her...threw up the entire pregnancy. Hi DeerDoe! I know the kidlets were a blessing, but hugs on the throwing up for the whole pregnancy! Shrimp pizza and watermelon - nice combo. I love sports novels, but I will admit that I haven't read any about golfers or bowlers. What's up with that, I wonder? The only craving I experienced (and it was a long, long time ago--my younger child is nearly 33) was for pickled beets. And I still love them! Hey Glenda! Great to see you here. Wow those are adventurous cravings! Bless your other half for indulging those! So can you still eat them or did the cravings turn you off? Oh and I can still eat them. No problems whatsoever! Hi Anna! *waves* Love your Ice Cats, I can't wait to read J.B. and Issy's story. No pregnancies for me so no weird cravings. I don't think I have any strange combinations of food that I eat maybe peanut butter and banana sandwiches? Hey Fedora! Fab to see you here! OMG losing the taste for chocolate! That must have been so weird! I'm glad it came back. We know someone who is allergic to chocolae, which is so sad! I didn't get cravings, but I couldn't drink tea either time. It just upset my stomach. I actually knew I was pregnant with my daughter about 3 days into the pregnancy because of this. Hi Mary! Great to see you here! Isn't that funny? My Mum knew she was pregnant because she hated certain smells - I think it was gasoline - and loved others - I think boiled cabbage - which was normally the other way around. Thank you so much to everyone who stopped by and joined in the fun! Loved some of the combos and cravings (except the pickled beets - blech!) And a special thank you and monster hug to dearest PJ. I hope you'll all say hi to me wherever you do social media! No weird combos. And no cravings either. Other than dessert. LOL. Hey Patty! Thanks for dropping by. Cravings for dessert - oh yes! My favorite weird combination of food is peanut butter and pickles. Yummy! Hey Karyn! How are you? Lovely to see you! Thanks so much. LOL men are such delicate creatures, aren't they? Best wishes with the new book. I really do not have anything weird that I eat. Hi Karen! Thanks for stopping by! That's okay - there have to be some normal people lol! Congrats on the book!! Most people I know think it is but I put Salt on my french toast. Hi Gabrielle! Thanks for joining the fun! Given how salted cararmel and salted chocolate are so fashionable no, it seems you're ahead of the game with French Toast! With my daughter I craved pickles and beef sticks. With my son it was always pizza. I always craved olives and had an aversion to ground beef. I had very serious morning sickness problems which worsened with each pregnancy (three).